In an ugly fits of rage yesterday, the Nairobi city Inspectorate Officers ended up throwing a teargas canister into a mini-bus full of passengers.The canister exploded, choking the innocent Umoja-bound passengers and started a fire that damaged the vehicle’s seats.The officers, who were marshaling traffic in the Central Business District (CBD), accused the driver of ‘obstruction an illegal parking’. “There was nothing wrong I had done because I had parked the vehicle by the roadside and I was not blocking anyone,” the matatu driver Patrick Kariuki told journalists.A confrontation ensued with Kariuki holding forth he was not doing anything wrong.It did not end there. 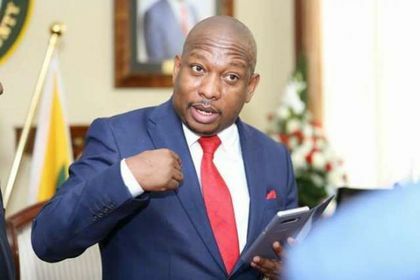 The city council officers popularly known as ‘Kanjos’ reportedly towed the mini-bus away before beating up the driver and his conductor.Now, their boss Nairobi Governor Mike Sonko wants them punished. “Hawa watakiona (They will face my wrath) Why throw a tear gas canister to passengers when provoked by PSV operators. My apologies kwa wale wametupiwa tear gas,” the County boss said. The post Why Sonko has promised to deliver wrath on Kanjos appeared first on Kenya Today.